The term Heimatfilm has long entered the lexicon of international cinema and is constantly being reinterpreted, with a notable resurgence over the past ten or fifteen years. The Austrian town of Freistadt even has been running a festival of “New Heimatfilm” for 30 years. Heimatfilme originated in the depressed post-World War II era, populated by a recurring cast of picturesque (mostly southern) rural backdrops, dashing and/or dark forest rangers and damsels in distress --even a future empress tom-boyishly hiking the Alps as in the SISSI sequels that introduced a 15-year-old Romy Schneider. The historic rom-coms and fairy-tale musicals gave a deeply traumatized and disoriented generation an opportunity to feel anchored, grounded, and safe again. The movies seemingly let people reclaim or reconstruct a home not tainted or destroyed by a nation’s complicity in the worst atrocities of the 20th century. Call it escapism, call it an attempt at healing and looking into an unmapped future, bright-eyed and bushy-tailed. There are outliers, and not just German ones, like the odd genre-onto-itself that is THE SOUND OF MUSIC, nearly a meta-Heimatfilm from afar, from an American perspective. An Austrian-German excursion that transported the Heimat idea abroad had already been produced two decades earlier, in THE EMPEROR OF CALIFORNIA (1936), the first “Nazi Western”, directed by and starring mythical Austrian mountaineer Luis Trenker. The Western in general could be considered to be the Heimatfilm of America, perhaps now replaced by small town indie films à la Gus van Sant. THE EMPEROR OF CALIFORNIA also harked back to what is often considered the very first Heimatfilm a decade earlier: the 1926 production THE HOLY MOUNTAIN by Arnold Franck, depicting an alpine love affair between Leni Riefenstahl and Luis Trenker. Fast forward. While the whole raison d'être of the New German Cinema of the 1970s was the revolt against their fathers’ cinema (and yes, fathers, the genre is still overwhelmingly male), Wim Wenders’ 1974 ALICE IN THE CITIES, oscillating between New York and West Germany, for me is a perennially fresh road movie Heimatfilm that paved the way for contemporary German filmmakers like Fatih Akin. Akin, it could be argued, makes localized Heimatfilme, as in the homages to his hometown Hamburg (SOUL KITCHEN), as well as big cultural Heimatfilme, with films circling his parents’ Turkish homeland and culture. Once could count Andreas Dresen's decidedly regional (East German) post-Wall films like GRILL POINT among the genre, in which he paints a picture of the border region between Germany and Poland at a specific, open time in history. What makes these newer reiterations more intriguing --and simply better films than many of the original fast food Technicolor kitsch-- are deeper investigations of Heimat, around leaving or staying, searching and finding, crisis and conciliation, a greater criticality and often engrossing (self-)irony, still packaged as fine entertainment with decent box office potential. On this blog and as part of our accompanying social chat on the question "What's your #SoundOfHeimat", we have pulled three very different filmmakers into the conversation, each with their own take: German documentary maker duo Arne Birkenstock and Jan Tengeler, German-Canadian filmmaker Wiebke von Carolsfeld, and Toronto director Kazik Radwanski (next up). 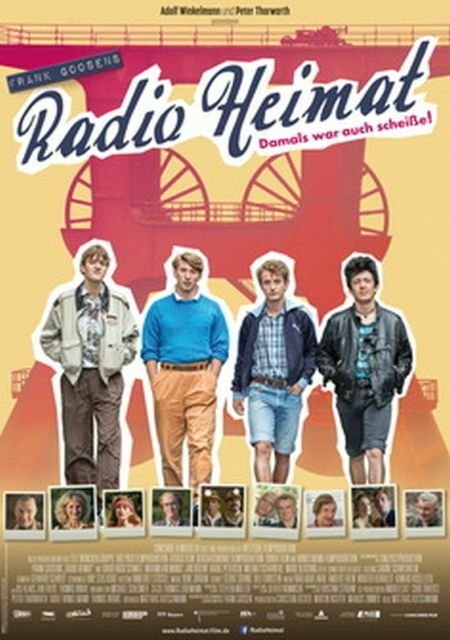 German TV must be credited with keeping the Heimatfilm concept alive, mostly through the provincial structure of the 10-part public broadcaster ARD, which produces tons of regional comedies, romance, crime and drama for the national market, such as the famous Sunday night TATORT detective stories very consciously situated in a dozen different areas and regional cultures. While mostly located in midsize cities, these films have created mental images of entire regions in the audience’s minds, from the rough working-class Ruhrgebiet to the rural-bourgeois Catholic Munsterland. The nearly tribal customs, cuisines, soccer club affiliations and mentalities displayed in these Heimatfilme, the dialects and habits and “feel” of different places —southern Germany being perceived as a bit slower than the West perhaps, the Rhineland famously more happy-go-lucky than, say, the taciturn North— are in a way the result of thousands of years of Central European migration, from the Swabians and Saxons to the Frisians and Franconians. The same can be observed from Hull to Hastings, from Calais to Cannes. As with many stereotypes you might find nuggets of truth — and points of (self-)identification. Writer Frank Goosen and actor-director Detlef Buck are great examples of what could be described as a typically north-western laconicism on screen that is reflected in LEARNING TO LIE and HOLIDAYS in our series. From our regional film puzzle “Heimat NOW" you can stitch together one big road trip across Germany, one in which I strived to stay away from any post-Wall “east-algia” or “west-algia”. I tried to let the smell of the different regions waft through my rolled down passenger window. If you look closer, you'll find a number of other threads and tropes that weave through the four feature films and one documentary (the crucial role of music being the most obvious of them) — spanning a whole lifetime: GRAVE DECISIONS, whose original title translates as "the sooner you die, the longer you're dead”, takes on the perspective of a child; LEARNING TO LIE is a classic coming-of-age story of leaving school and wondering where and who and with whom you want to be; HOLIDAYS describes what is now known as a quarter-life crisis, where a young woman consciously relocates to find refuge in a new place; SCHULTZE GETS THE BLUES shows us that the search for home and belonging is never over, and its loveable and adventurous pensioner-protagonist is a particularly resilient example of roaming continents to get where you need to be (as so often, and repeatedly in our series, involving the imagined dream destination America). "Heimat NOW" is only a teaser menu, an invitation to revisit the genre 3.0. Films I wanted to include in this series but did not have the space to show are are of course Edgar Reitz’ 16-hour mammoth oeuvre HEIMAT, and director Sönke Wortmann’s 2016 omnibus documentary GERMANY IN A DAY, compiled out of 10,000 home videos answering to the question what Germany means to the people living there today. Drop me a line, arguing for your personal favourite Heimatfilm, German or not, new or old, MY WINNIPEG or LA LA LAND or TRAINSPOTTING 2, for your chance to win tickets to our film series March 7-14. And stay tuned for more on the subject this year: We will cast a curious and critical eye on those early Heimatfilme in a special edition film series in August, a prequel to this "Heimat NOW”, at Toronto's Revue Cinema, where these films played when they came out 60 years ago. For that matter, our May GOETHE FILMS series called “PEAK German Docs” will feature an alpine eco-drama and a rural migration comedy. As you can see, the hills are still alive with the Sound of Heimat.